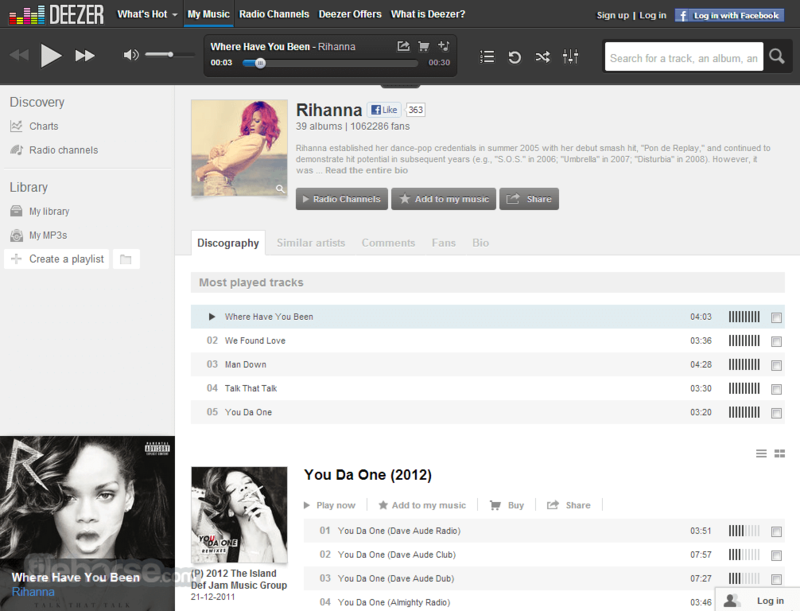 Deezer is a new online service that enables everyone to experience music like never before, no matter where you are. 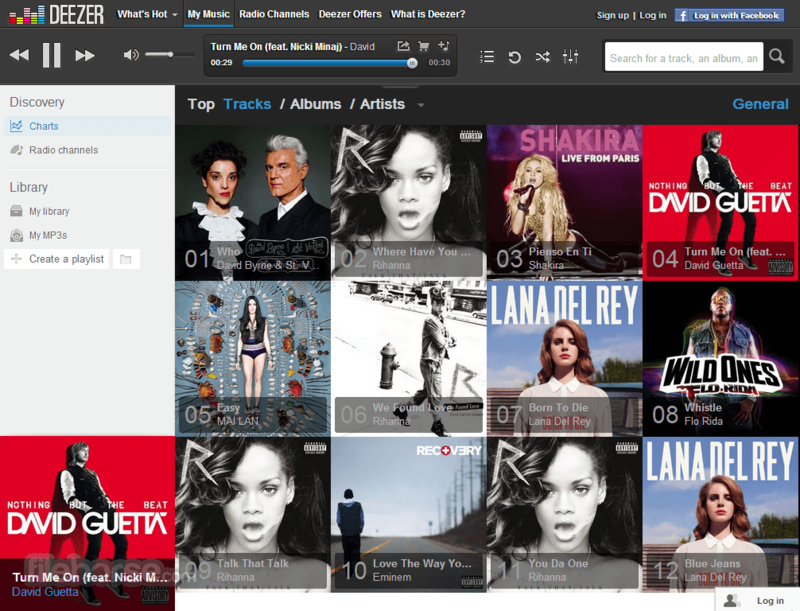 The defining unique characteristic of Deezer is its ability to be embedded on any website or blog you own. 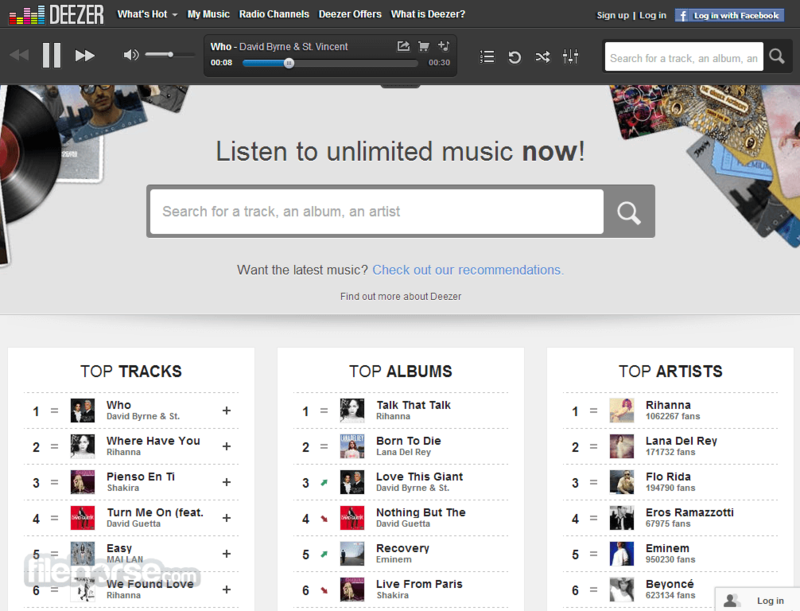 This way, your customers can experience music in their browser, without the need of vising Deezer’s website. Listen to all the music online! When you vising Deezer, you will instantly be greeted with thousands of bands, millions of songs that will be perfectly reproduced using powerfull cloud base architecture that can be experienced on any modern web browser that you use. 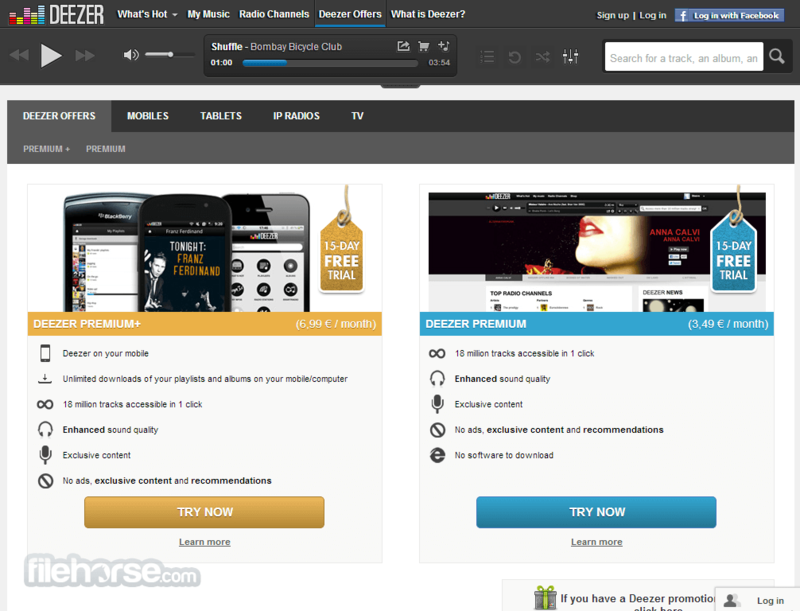 If you want to enrich your website or simply to enjoy music, Deezer will be perfect solution for you. Just take note that currently unregistered user can use custom widgets only in 15 day period, and their playlists can be stored only up to 3 years. Deezer is an excellent competitor to popular audio streaming services such as Pandora, Rdio, Spotify and Grooveshark that have managed to carve out large part of internet user base, which is not so bad because their dominance forced both older services like Deezer and countless newcomers to innovate and offer highly competitive services that can bring innovation across entire field of music streaming industry. Deezer manages to very easily compete in this competitive environment by not only utilizing its long experience (its history dates back to mid-2007 when this Paris-based service was formed), but also by utilizing large music library and great user interface that showcase their service in best light both on PC, portables and even Smart TVs. Available on all continents and almost every country and territory in the world, Deezer manages to effortlessly bring the world of music into your life, with great tools for managing your song library, discovering new artists, and sharing your best music to your friends and family on other social networks. Deezer is a popular French-based web-based music streaming service with a large musical library that has surpassed 30 millionlicensed tracks and over 30 thousand radio stations that can be enjoyed not only via your PC, laptop, smartphone or tablet internet browsers in 182 countries of the world but also via wide variety of supported devices that will enable you to truly stay in contact with your music no matter where you are and what you are doing. Listen to all the music online! Some of the most useful features of Deezer is its great search tool that can quickly intensify your query and offer you direct links to songs, artists and albums that you are searching, ability to create your own playlists, follow your favorite artists, integrated recommendation tool that will recommend you editorial picks and which users have similar taste as you, deeply integrated social network sharing tools (Facebook and Twitter), and rarely found ability to cache your favorite songs on your local storage so that you can listen to them even if you are offline. Free version of Deezer is available only for desktop web access, while portable device users need to pay for a €6.99 monthly subscription plan that will unlock them not only unlimited music listening but also offline caching and removal of ads. Interface of Deezer is truly phenomenal, enabling you instant access not only to your basic playback tools (which are always present in the top of your browsing window), but also excellent interface for managing search results, your own playlists, apps, and songs in your library. Song management is especially made easy by enabling you to work with multiple song selections, and even have sub-search of individual results that you have acquired by using main search. So for example you can search for “Elvis” and then search the results for the words “love”, “man” or “you”, easily finding no matter what you are searching. Deezer has 3 tiers of usage. Free tier is available only for web interface on desktop PCs and laptops, giving you access to 6 months of unlimited service, after which you will be limited to only 2 hours per month. Premium service with higher audio quality and unlimited listening time costs $4.49/month, and support for mobile apps, TV apps and offline song caching is available only with $9.99/month Premium+ tier. Deezer is a good music streaming service that obviously can cater to anyone who wants to build their own library without any size restrictions, but its large focus on paid subscription tiers make it unappealing to everyone who wants to use it for free even if that entailed some more ads. Sadly, that is not available on Deezer. With over 20 million tracks on Deezer, you're sure to find more music than you could ever dream of. 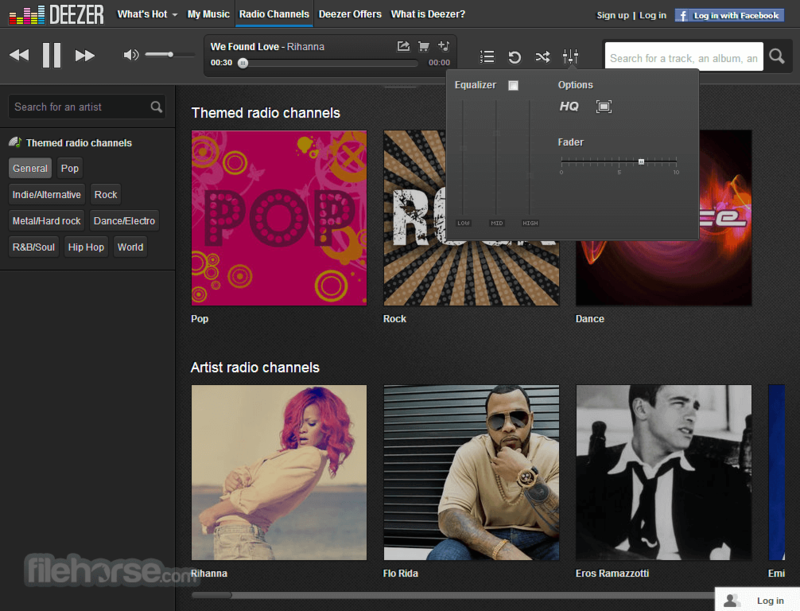 Follow your favourite artists, create your own playlists and listen to music all day long. Listen to all the music online! Need help choosing what to listen to? Why not browse our editorial picks and personal recommendations? You can even follow members with similar tastes in music and discover new acts. When you're on the go, you should be able to listen to anything you want, when you want. With millions of songs accessible from any device, even offline, turn your daily commute into a party and create the soundtrack to your day. When you love something, you want your friends to know about it. Share your love for music: post your favourite tracks on Facebook and Twitter and get your friends to join in.